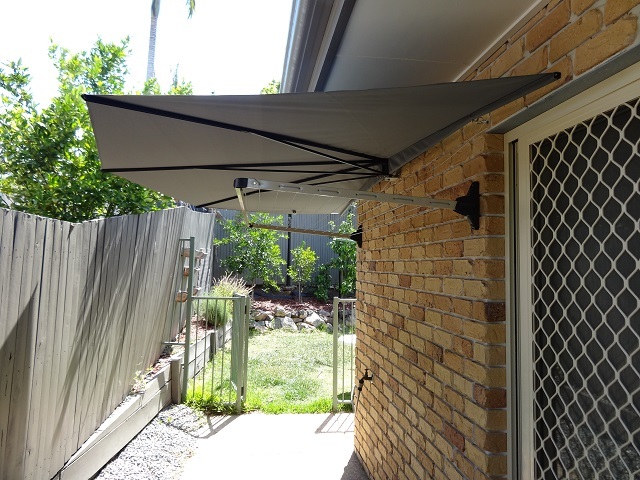 CleverShade® 180° Wall-Mounted - Umbrellas patio, shade umbrellas, pool umbrellas, shade sails, Australian made for Australia, awning. Are you looking to extend some shade from a fixed wall in your home or place of business? Look no further! This 180° wall mounted shade is perfect as laundry/clothesline shade, and is suitable for many other uses. Our CleverShade wall mounted model is a fantastic solution for those looking to cover a patio area, extend an awning out over a special area or any number of other scenarios that even we haven’t come across yet. You can trust this wall mounted shade is both sturdy and convenient because it’s Australian made for Australia. We use only the strongest material to make CleverShade products absolutely top notch for our customers. The best part is that after you’ve done the installation of the bracket on the wall, there’s absolutely no pegs, poles or ropes needed. This means that you don’t have to worry about where to place a table and chairs around the post of your umbrella or patio cover. It measures 4.1 metres wide and is 2.1 metres deep allowing for quite a lot of coverage with a large amount of convenience. Perhaps you’d prefer the comfort of shade on your vehicle instead. Well, CleverShade is world famous for covering people on the go in countless different climates and conditions. We’re especially loved by those brave enough to drive around the outback in Australia’s summer months. Take a look at our 4×4 vehicle shade here. If the wall mounted 180° CleverShade sounds like the perfect solution for your outdoor shelter problem but you have one or two questions then please feel free to fill in the form to contact us and we will get all the important details back to you ASAP.